Gwyddelwern is one of the ancient parishes of Merioneth. At one time, it had three divisions: Cwm, Uwch Mynydd, and Uwch Afon. The Uwch Afon division was entirely detached from the rest of the parish until 1854, when part of the division (the townships of Cynwyd Fawr, Cynwyd Fechan and Bodheulog) was transferred from Gwyddelwern to Llangar. On 1 November 1864, the remainder of the Uwch Afon division (the township of Persaethydd) was transferred to the new parish of Llawr y Betws. The church was mentioned in the Norwich Taxation of 1254. 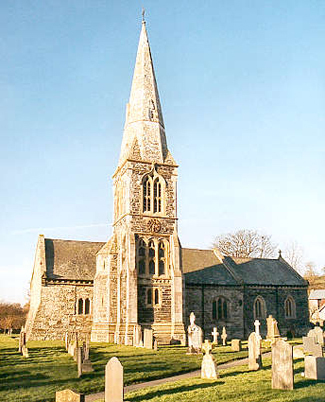 It was extensively "restored" in 1880, when the new tower and spire were added. For family history information about the church and parish, visit the GenUKI Gwyddelwern page.